← Ever Been Properly in Love? Posted on February 14, 2014	by Blog Woman!!! How do kids say Happy Valentine’s Day? Well, if you’re a kid at my kid’s school you put on a heck of a show assembled in the school gym and tell everyone gathered about other amazing children who risked their life to make a difference for humanity. They spread the news that even this day’s audience could make changes for a better world and showed them some important ways how. 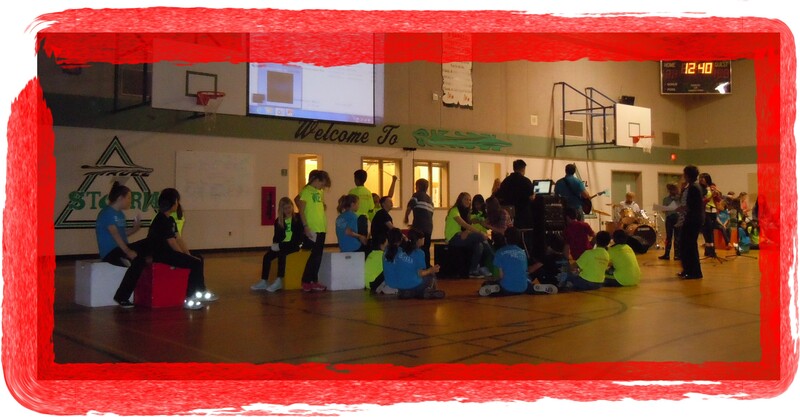 A few of the various social responsibility groups within the school came together to create a mini version of WE Day. WE Day, is an organization that was begun in 2007 by young Canadian brothers, Craig and Marc Kielburger, who wanted to wake-up children to the idea that even though they are too young to even vote, they can still be an instrumental part in exercising change for each other and for people around the world. They present a very potent message of empowerment for kids. 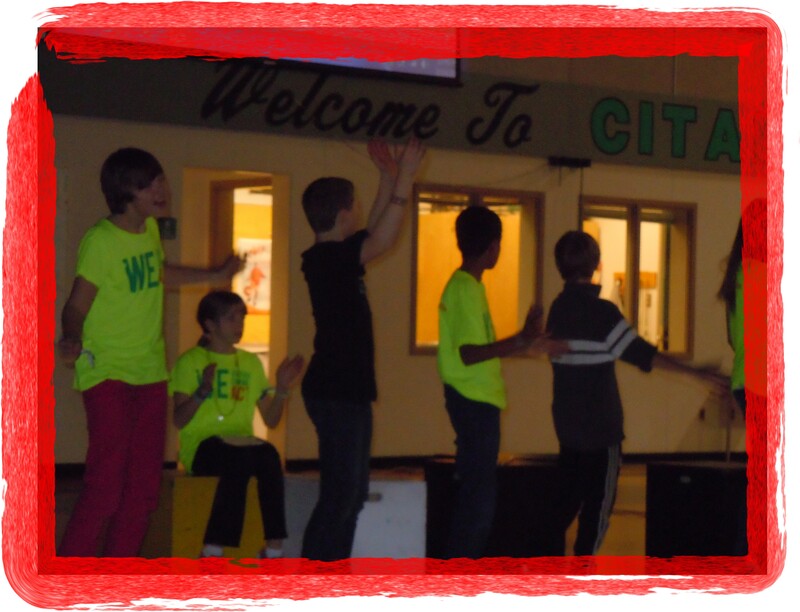 The WE Day organization spreads its message primarily through large concert settings, also titled WE Day! They enlist participation from renowned civic leaders and activists, high profile celebrities, and local students from elementary and middle schools. They fill stadium after stadium with enthusiastic kids who get informed, empowered, and pumped up to take on the world. Then they take home ideas and plans to get to work in their own communities. 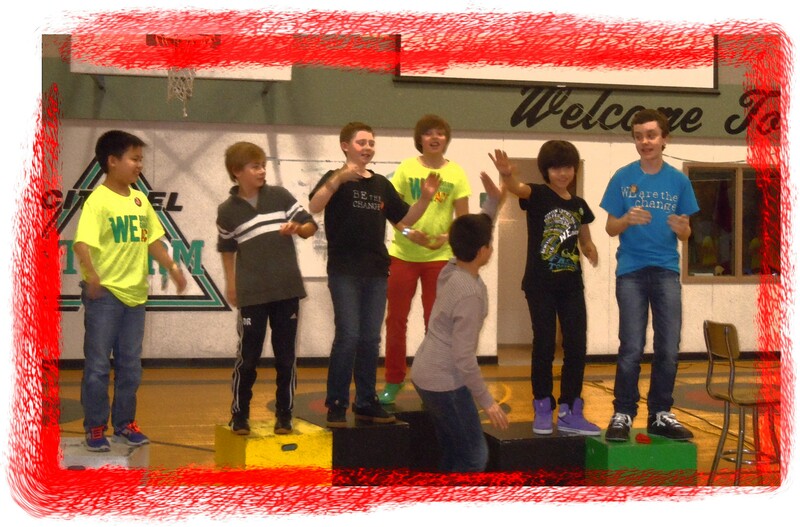 The school group that lead the show today were leadership teams from grades 6 to 8 that had gone to WE Day this year. They led and encouraged the assembled by reading stories about social changers, singing songs, playing music, dancing, and informing with various video presentations. They introduced the students to the stories of 12 yr. old Iqbal Masih and at the time, 13 yr. old, Malala Yousafzai, two children of prominence because they respectively lost and almost lost their very young lives by standing up for the right to an education. In fact, it was Iqbal’s story in 1995 that riveted the attention of Craig and Marc and spurred them onto creating social change projects and ultimately the WE Day organizations. One student presented a powerpoint report on his own family’s visit to Africa last July to help build schools for the children there. The pictures showed how the schools were shambled wrecks of barely there walls and roofs and then the beautiful and solid replacements that now stand in their place. Other students got up and sang songs by Taylor Swift, some presented ideas on how to be givers of donations or time and showed where it would help. There was even the crazy-talented teacher band who played and sang their hearts out, and proud mom moment here – my son did a drum cover with Hedley song “Anything”. They turned the lights down and balloon balls went into the air, and the kids were off on a singing, ball tossing, cheering high note. A lot of effort went into this day of kids wanting to take care of other kids, and kids taking care of kids in real ways that matter to real life day-to-day. The school administration and staff poured their support into it too. It made you want to weep and sweep them all up into your arms in sheer joy, pride and gratitude. Every one of them spoke, sang, danced and played the spirit of their hearts into ours, and as we danced our way out while the teacher band was playing (Brave), I couldn’t help thinking, this is what the day is really about. This is really Valentine’s Day, this is the heart of We Day. This entry was posted in Inspiration, Life, love, Social Responsibility, Valentine's Day, WE Day and tagged giving, leadership, school, Social responsibility, students, Valentines, Valentines Day, volunteer, WE day. Bookmark the permalink. What a great school to send your child to, Robyn. And as much that I love how Valentine’s day typically celebrates romance it really should be about all that love can encompass. Thanks for letting me know about WE day. Happy WE day to you! I feel a little better about the future now. Yeah, the more we keep out them of the pop world, the better! Thanks for your visit Hook, it’s always puts a smile on my face – almost as much as your crazy posts. I aim to please, Woman. this is wonderful! great to see some good being shared about our next generation. they get such a bad rap for the actions of a minority! so many amazing children out there. Thank you! I was pretty impressed with how it all came together. I’ve been really happy with how our community models responsibility for kids too. There really are a lot of reasons to feel good about whose coming up behind us. Cheers to you!